Martin Hicks introduced the conference with concepts such as the global public good. In the area of open access, he reminded us of the terms Platinum/Diamond open access, which are journals with no article processing charges (which can reach £5000 per article for some other OA journals), but which go with the challenge of ensuring that more gatekeepers of this global public good are needed to avoid being overwhelmed. He ended by asking us all to consider what the unit of knowledge is that needs to be shared. The first talk was by Klaus Tochtermann who (amongst other topics) brought to our attention the Dutch GoFAIR initiative in the European Open Science Cloud, sub-divided into Go-train (i.e. data experts, who will build e.g. metadata tools) and Go-build (eco-systems: Internet of FAIR data and FAIR services). I think the message is that all organisations with chemistry labs should consider this as being an essential part of their future infrastructures. Jeremy Frey’s title was Reducing Uncertainty: The Raison d’Être for Open Science who defined the fundamental principles of open science as transparency, capability and obtainability and encouraged data publication at source (as opposed to e.g. PhD writing up period) to ensure fidelity in the capture of metadata. The team of Leah McEwen, Ian Bruno, Stuart Chalk and Richard Kidd told us about Global Data Initiatives and Chemistry and the need for social and technical bridges to enable open data sharing. I learnt for example that the IUPAC Gold book of chemical terms and definitions now has DOIs for each of the terms. Thus chemical shift (DOI: 10.1351/goldbook.C01036), spectroscopy (DOI: 10.1351/goldbook.S05848) and electron density function (DOI: 10.1351/goldbook.ET07024). I will now to associate such links with e.g. deposited NMR data to help increase the semantics of the data (see e.g. DOI: 10.14469/hpc/1975). 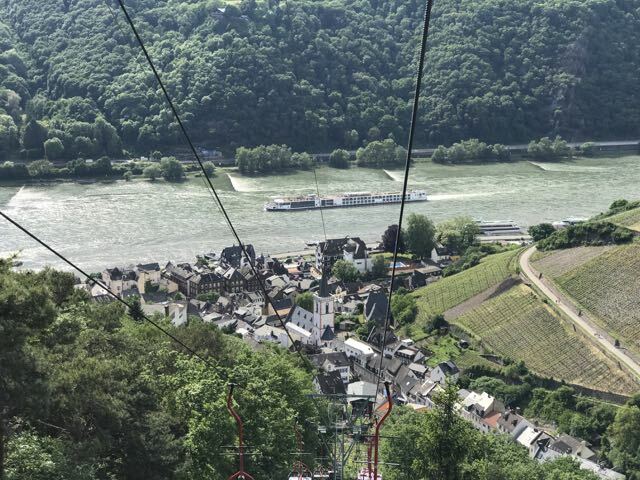 Finally, a photo from the region, taken from the gondola adjacent to the venue and riding down to the small town on the banks of the Rhine. This entry was posted on Tuesday, May 23rd, 2017 at 7:08 am and is filed under Chemical IT. You can follow any responses to this entry through the RSS 2.0 feed. You can leave a response, or trackback from your own site. One aspect I reported on in my own talk at this conference was a concept known as EventData. Put simply, it has the potential to connect publications (stories about data) with the data itself (which may not be entirely contained in the former). For a more complete analysis by Martin Fenner, see doi: https://doi.org/10.23640/07243.5131774.v1.